DRUMBEATS (32), BASSLINES (16), ARPEGGIOS (32), PANS, GATE EFFECTS, PORTAMENTO, FILTER & RESONANCE SWEEPS, POLYPHONIC PITCH BEND, CUBASE MIXER MAPS. A construction disk for techno/dance music. 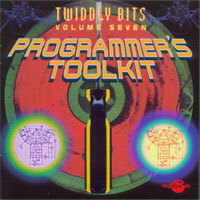 Programmer's ToolKit won the coveted Platinum Award in Britain's Future Music magazine when it came out in the late 1990s, and still offers plenty for the electronic composer or performer to this day. Regimented drum beats, pumping basslines, swooping keyboard riffs, and arpeggios, Programmer's ToolKit also contains special files that enable Yamaha XG format instruments (and Roland GS) to produce classic analog synth effects like filter sweeps, and resonance whistles. Straight and cross-beat 4-bar arpeggios, basslines, drumbeats, and cool synth parts to mix and match. Standard MIDI effects usable by any MIDI sound source include automatic pans, MIDI gate effects, portamento, pitch bends.